CONCORD, N.C. (Jan. 15, 2016) – SEA LIFE Charlotte-Concord Aquarium welcomed four green sea turtles for temporary rehabilitation today. Cold-stunned by the widespread sudden drop in water temperature along the North Carolina coast, the juvenile sea turtles will be nurtured back to full health by SEA LIFE’s team of aquarists before being released back into the wild. Every winter in the coastal region, a number of sea turtles miss the southward migration and become susceptible to suffering a hypothermic reaction from being exposed to prolonged cold temperatures, commonly known as “cold stunning”. This exposure hinders a sea turtle’s ability to properly regulate its body temperature and causes it to quit swimming which leads to floating, infections like pneumonia and stranding. The number of green sea turtles who missed this year’s southward migration is more excessive than in past years, and the drop in temperatures off the North Carolina coast caught several hundred sea turtles in water suddenly too cold for them to survive. 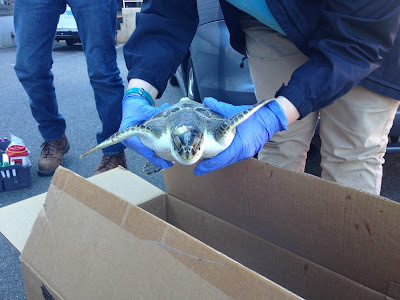 The green sea turtles’ rehabilitation at SEA LIFE Charlotte-Concord is a prime example of SEA LIFE’s “Breed, Rescue and Protect” conservation program in action. SEA LIFE is passionate about conserving marine habitats and protecting the incredible species that live in them. As an AZA-accredited aquarium, SEA LIFE Charlotte-Concord joins other facilities throughout North Carolina that are fostering the rescued sea turtles. The rehab process includes regulating body temperature back to normal and treating the creatures with antibiotics to fight infections. Once each turtle is at full strength, in about three weeks, they will be sent back to the coast. For their health and safety, SEA LIFE’s rescued sea turtles will not be on display at the aquarium, but guests can learn more about them on the aquarium’s Behind-the-Scenes Tour. Admission tickets are available online for as low as $12.95. For more information, visit www.visitsealife.com/charlotte-concord. SEA LIFE Charlotte-Concord is a 26,000-square-foot indoor aquarium with another 10,000 square feet planned for future expansion. This one-of-a-kind attraction allows visitors to experience the magical world beneath our seas with marine habitats, displays, and close encounters with thousands of sea creatures. SEA LIFE provides a glimpse of the diversity of marine life while also playing an active role in animal and environmental conservation. Visitors see strong evidence of SEA LIFE’s Breed, Rescue and Protect activities around the world, including new projects developed locally. SEA LIFE is the world’s largest aquarium chain with over 45 attractions around the world. SEA LIFE Charlotte-Concord is the sixth SEA LIFE aquarium launched in the U.S. and parent company Merlin Entertainments’ 100th attraction worldwide. SEA LIFE Charlotte-Concord is located at Concord Mills, 8111 Concord Mills Blvd. in Concord, NC. For more information, visit www.visitsealife.com/charlotte-concord.